Are you looking for reliable cloth diaper patterns to make your own diapers? Sewing your own cloth diapers can save you money and you're guaranteed to get a diaper that fits your baby perfectly! And making your own quality diapers isn't that hard if you follow an on-line tutorial and start out with good pattern! This article includes links to several online patterns for cloth diapers, plus helpful tips for you as you're starting out! It can be hard to find a perfect cloth diaper pattern to fit your baby. There are lots of great free patterns available online, but finding them via search engines can take awhile. While this article is by no means a complete list, it's a great resource to help you as you get started! Below are links to a number of cloth diaper patterns that are available for purchase or free on the internet, including patterns for pocket diapers, all in ones, fitteds, covers, and soakers. Have fun sewing! Goodness Gracious Diaper Patterns - FREE! - Fitted diaper, with sizing for preemies and dolls too! Rocket Bottoms Newborn Fitted Pattern - FREE! Homespun Aesthetic Hybrid Fitted Pattern - available for purchase on Etsy. I was a tester when this pattern was in development, and they have done a great job with the instructions and design (see diaper below). Katrina's Soaker Patterns - FREE! - A popular free pattern for wool and fleece soakers. Newborn and One-Size Covers - FREE! -An easy cover pattern that includes adjustable rise snaps and fold-over elastic binding, plus option for hook and loop or snap closure. The Nappy Network - FREE! - A New Zealand site that offers a pattern for lycra knickers - a type of diaper cover. Sanity Saving Training Pants - pull-up style with easy-open sides and back pocket opening for customizable absorbency. We've used this pattern and LOVE the trainers made from it. Here is an up-close view of our Sanity Saving Trainers. RRP (Rita's Rump Pocket) Diapers - FREE! - Includes patterns for all-in-ones, fitted (called contour) and pocket diaper patterns. Ottobre Design Diaper Pattern - FREE! - An all-in-one pattern with sizing for 0-6 months plus 6-18 months. 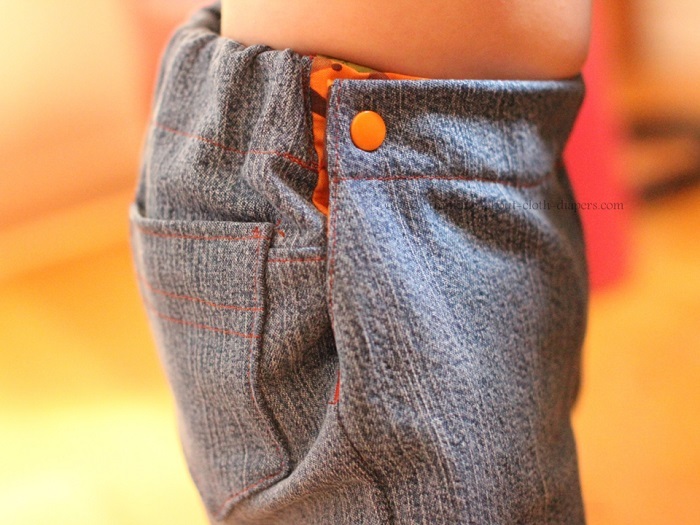 Beanstalk Britches - a cloth-diaper friendly jean pattern that features grow-with-me cuffs and a snapped waist band. I've tested out this pattern, and you can see the results below and more photos in this article. Darling Diapers - Offers patterns for training pants and diapers, plus a free newborn pattern. Patterns can be licensed for re-sale. Please note: When I was first starting out, I made my own diaper pail liners and travel wet bags, but didn't sew my own diapers. Since then, I have experimented with sewing my own diapers, but I have not used any of the patterns found in these links. This list is a compendium of great resources that have been tested by other parents, but I am not endorsing or recommending any of the patterns listed above, as I have not tested them out myself. If you know of another great pattern, please let me know so I can share it with others! Start out with something fairly easy! You would likely find that modifying a t-shirt or a prefold into a fitted diaper is easier than sewing an all-in-one, so start out here and build your confidence! 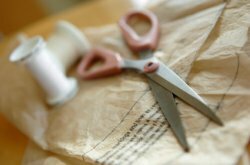 If you are testing out a pattern for the first time, you may want to consider making it out of scraps of fabric or inexpensive material. My favorite diaper fabric is old cotton t-shirts - you likely have a bunch around, or you can buy them at a thrift store for next to nothing! This way you can test and make minor modifications to your diaper without ruining your expensive cloth diaper fabrics. Don't give up if the first one doesn't turn out perfectly! The first couple may look a little sloppy, but they will likely function fairly well. Practice makes perfect, but remember... they're only diapers, after all! Really, if you can afford it, it's usually worth it to buy a pattern. True pattern makers usually provide more detailed cutting and sewing instructions plus tips on selecting fabric - and support if you have more questions!